This past few weeks have been incredibly busy, with school ending tomorrow and exams starting next week, I have had not a lot of time to dedicate to writing. But, I have been busy in the diabetes world, that is for sure! I found out this week that I was picked to be a Young Leader for DTreat, a organization that runs camps for young adults with diabetes. I was selected as one of ten leaders from North America to help run and organize the camps across the two countries. I am very excited to be given the opportunity. I look forward to meeting new people across North America and becoming a more inspired individual throughout the process. I also found out that I was selected to represent Canada at the International Diabetes Federation in Melbourne, Australia this year in November. This opportunity is amazing. I will be working with other representatives from different countries as well as talking with the World Diabetes Congress. It couldn't have been a better week. On another note, I am now wearing a pink insulin pump. After getting three 'motor errors' on my pump I called Medtronic to get a new one. It seemed to be O.K when I did the rewind and prime; however, I was getting uneasy about wearing a device that was malfunctioning at random times. Medtronic was so awesome and sent me a new pump within 2.5 hours. I decided to switch up the colour and get the pink one. 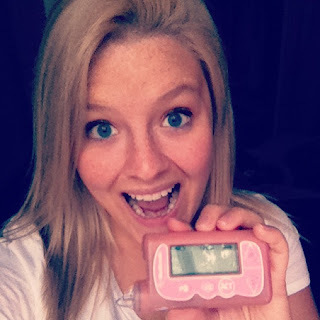 I am really enjoying the pink, but I feel a little sad about letting go of my very first insulin pump. Well, I am hoping to get back into routine now with writing. I am still working hard at training and looking forward to kicking off summer at the end of this month!